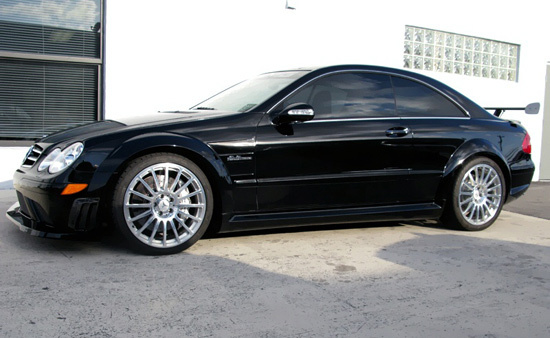 The Mercedes CLK63 AMG Black series is based on the official F1 safety car and incorporates the pinnacle of Mercedes’ performance technology therefore any tuner wishing to enhance this package has a challenge on their hands, a challenge Renntech was more than willing to take with the release of their latest tuning program. The monstrous 6.2-liter AMG engine already pumped out 507hp and 630Nm of torque but the Mercedes tuner has managed to pump this up up to 550hp with an additional 60-80Nm of torque. Achieved with a bit of ECU tuning and the addition of long-tube headers and a motorsports style exhaust sharpening throttle response. For additional drivability Renntech has intsalled its own sport suspension system lowering the car by an extra ¾ inch and added carbon fibre stut braces to both the front and the rear along with fully-adjustable camber bushings at all four corners which enhance mechanical grip in fast corner. The Aerodynamics are enhanced with the addition of a front splitter and rear diffuser along with the striking carbon fibre rear wing.